A young kitten can often cause havoc for your older cat. Just think, your existing cat has lived in peace and quiet and suddenly this little bundle enters their territory all energetic and boisterous -it's bound to ruffle some feathers. Some cats can take a long time to accept each other, some may never accept each other, and some might co-exist in relative harmony. One of the key factors in helping them cope better in each other’s company is to modify the environment to make it easier for each cat to find enough personal space. In essence, by providing each cat with their own collection of resources, such as feeding and water stations, litter trays, and so on, positioned in separate areas of the house. This should immediately reduce stress and tension as it will enable the cats to associate with each other without the complication of competition for food or space. It is also essential that your existing cat feels safe and secure, and can also escape the unwanted harassment from your kitten. Try creating more high-up resting places, such as cat trees, cat perches, and so on, where he can flee to should he feel that he needs a bit of quiet time. It might also be worth allowing your older cat access to his own room in which your kitten may not be able to get to, this will give him a safe space. 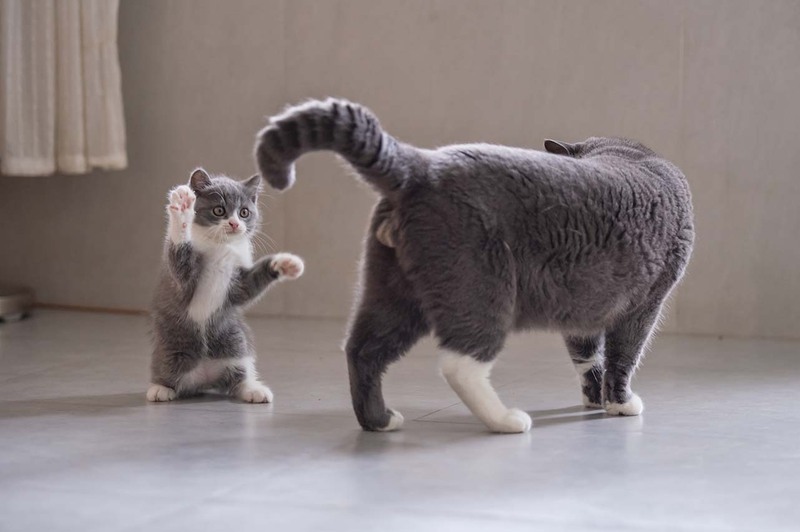 Finally, your kitten is bound to have a lot of energy which can be directed at your existing cat - not necessarily in a malicious way, but more in a playful manner. Provide him with interactive daily play sessions; three 10-minute sessions using toys that will stimulate his predatory drive — fishing rod-style toys with feathers are ideal to keep him active. It is important to introduce these steps when you first get your kitten, it can help to prevent your kitten from becoming a bully, before it is too late. Avoiding aggressive behaviour in your kitten from a young age, will help to create a more harmonious home for you and your cats. Multi-cat households can be challenging but, if you have the right balance of cats and sufficient resources are put into place, things can work out. If you need any more advice then check out our article on introducing a kitten to a cat.